If you suddenly find yourself scrambling to decorate for Halloween, this post is for you. 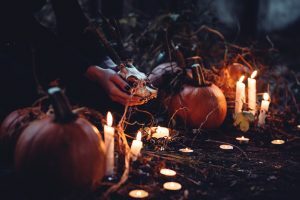 It happens to the best of us, so I’ve gathered up my favorite fast and easy crafts to jazz up your outdoors as well as indoors for the spooky season. It’s never too late to get started (unless it’s November 1st lol). Each craft is designed to be done in an hour or less, the only thing you’ll need to plan slightly is some of the items you’ll need, but I aimed to have items that you would either have on hand already or could get with a quick dash to your local Walmart or Michaels store. If there’s time to ship it, Amazon can also be an excellent source. So let’s get you some quick and easy ideas to get your outside looking super creepy. Outdoor Halloween props are probably my favorite things and I had loads of fun researching these options on Pinterest. So if nothing here grabs you, I guarantee a search on Pinterest will get you some results. Okay, I’m starting with a pretty basic decorating tip, but pumpkins instantly call to mind fall and halloween! You just need to amass a collection of real or fake craft pumpkins. I’ve seen everything from using a drill to create a word or design to simply using paint to create a spooky display. If you’re stuck, check Pinterest, I just searched “Craft Pumpkins Ideas” and came up with loads of ideas. My only advice is whatever you do, keep in mind to use exterior paints as the interior ones may not stand up to any weather your craft might experience! What’s more spooky than creating your own impromptu graveyard? I love these and it’s a chance to be a bit creative. If you’re somewhat handy with a saw and are willing to do a bit of painting, you can usually find a decent stencil online that you just need to print out and draw onto your work. Birds and Soap has some creative ideas. These are so easy and quick. To create, you’ll need an assortment of empty toilet paper rolls, a cutting blade (such as an Exacto knife), glow sticks and some duct tape. The full tutorial is available through Rust & Sunshine. Super quick and easy, you just need a collection of old milk jugs, a black permanent marker, a cutting blade, and some lights. You can check out the full tutorial at Eighteen 25. So we’ve taken care of your exterior, now let’s look indoors, shall we? I won’t repeat the Pumpkins from the previous heading, just remember they can be used to create a beautiful centerpiece (and for indoor projects you don’t need to worry about sealing or using exterior paints). I love this idea, A Pumpkin And a Princess added an extra unique flourish with twinkle lights. This is seriously cool, you just need some twigs, cardstock bats, some hot glue and a glass vase. Check out the full tutorial from The Sweetest Occasion. The result is a classy and spooky table topper to add a bit of Halloween magic to your indoors. DIY Candy came up with this one and it’s seriously cool and easy to make. You need an apothecary jar, a skull, a LED light, some black floral sand and a touch of black paint. Seriously cool, Tried & True created this super inventive wreath using skeleton hands and a chalkboard circle. 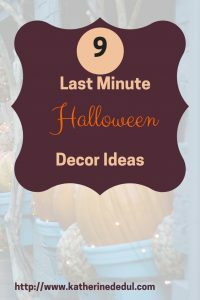 So there you have it, a few ideas to quickly spruce up your interior and exterior and proof that you can still create some Halloween cheer. If you liked what you read, let me know down below in the comments. Also, please share this content using one of the share buttons and spread the love and spooky cheer!